Birchington is a few minutes drive from Canterbury and very near Margate and attracts lots of visitors during the summer months. Mulberry Tea Rooms sits right at the top of the Station Road and is of traditional in appearance. I visited this little tea room with my mother and decided to pop in for lunch, or more accurately, an early dinner. Black beams on the ceiling and a lovely open gas fire makes this little tea room warm and welcoming. There is a large glass counter displaying a large selection of cakes and deserts, which my mother declined due to the large size of the desserts. I had a jacket potato with prawns and my mother a steak and kidney pudding and vegetables .Although the meals were nice, it was on a pricey side. There is a specials board outlining a special menu from Monday to Saturday. There is a large selection of meals including vegetarian meals and during the summer months, the garden is open at the back for that little extra piece of quiet and solitude. The toilet was outside, a bit of a pain, as it was raining the day we visited. The painted pictures on the walls and the pine panelled walls, blue and white walls, some with wallpaper, make the tea room a quiet place to relax. 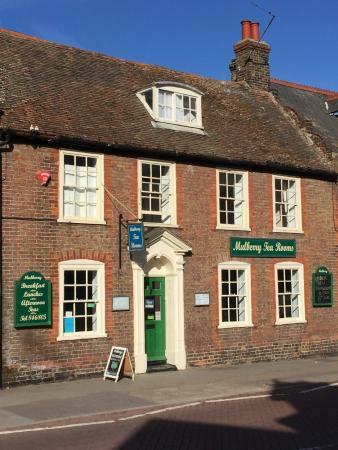 I can recommend the Mulberry Tea Rooms. Parking can be difficult, but if you park on the side roads before you drive into Station Road, you shouldnt have much trouble parking for free.